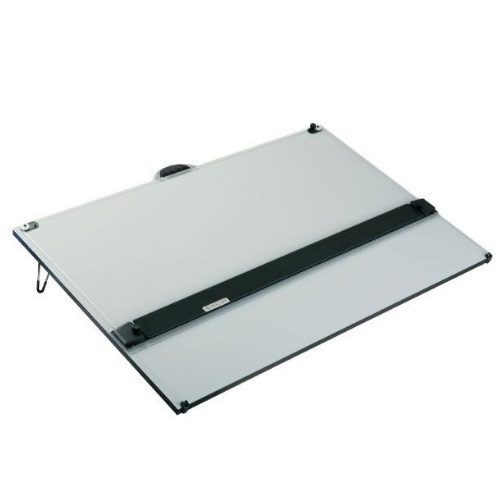 The Alvin DPX Series Deluxe Board is a portable drawing board equipped with deluxe parallel straightedge and protective board cover for various drawing and drafting applications. It's the perfect solution for students or professionals who require a precision drawing tool, but lack the space for an art or drafting table. The durable straightedge blade is equipped with clear acrylic inking edge and nylon bearings for smooth motion and even support over entire work surface. Blade remains parallel at all times, gliding smoothly up and down on guide wires. The Alvin DPX Series Deluxe Board has a smooth Melamine surface which works well for drawing. Particle board substrate for strength and durability. Work surface is protected with a layer of pliable VYCO board cover. It offers folding metal legs which are set at an angle to prevent accidental collapse and include rubber-dipped ends to prevent scratching. The board can be used in the elevated or flat position. Rubber grip tracks underneath allow front of board to overhang a table edge up to 8". This increases the working angle and brings the drawing surface closer to the user. Compact, folding design for convenient transportation and storage. No assembly required. Ready to use. 30" x 42" board size. Weighs 33 lbs.